Fast jet pilots have begun training at a brand new test facility to help them cope with the physical effects of accelerating at top speeds in mid-air manoeuvres. The £44m centrifuge officially opens on Monday at RAF Cranwell in Lincolnshire. It has a built-in simulator to enable aircrew to practice missions under high levels of G-force. Global aerospace and technology giant Thales and its Austrian contractors AMST built the centre. 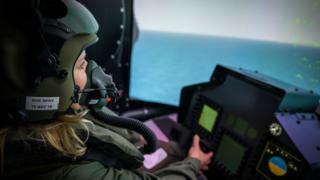 Thales UK has the contract to maintain the building over the next three years and train hundreds of RAF and Royal Naval pilots. The facility, owned by the Ministry of Defence, replaces the current RAF's High G trainer in Farnborough, which dated from the 1950s and was little more than a seat at the end of a large spinning arm. The new centrifuge accelerates from zero to 9 G (about 60mph) in just one second, spinning 34 times a minute. In the gondola, a virtual cockpit can be reconfigured to allow pilots to fly Typhoon combat aircraft, Hawk jet trainers or the new F35 vertical landing Lightning jet. Wearing G-trousers which inflate to help push blood back towards the brain, pilots are also taught G-strain drills during their tests in the centrifuge. These are physical exercises and breathing techniques to ensure they stay conscious during high levels of G-force acceleration. The BBC's Susannah Streeter was allowed in the centrifuge to experience first-hand what it's like to cope with very high levels of G.
Dealing with the effects of G-force acceleration is a formidable physical and psychological challenge. I was flown in many different aircraft as a RAF Reserve officer but never in a fast jet and until I was spinning in the gondola of the centrifuge, I had not fully appreciated the effects high levels of G-force can have on the body. As the acceleration began, I was subjected to an intense level of pressure. The special inflatable G-suit I was wearing mitigated some effects, by stopping blood pooling in my feet and legs. Tensing my glutes, thighs, calves and my abdomen also displaced blood away into the arms, chest and brain. The breathing technique is also key to withstanding the pressure, which involves rapid exhalation followed by holding the breath and tensing the chest for three seconds at a time. Such G-strain manoeuvres are potentially life-saving for pilots, who are at risk of losing consciousness at very high levels of acceleration and deceleration. I was subjected to 4.5 G for 15 seconds at a time, the maximum allowed for a civilian in such circumstances, but pilots in the new F35 Lightning will have to cope with double that on future combat exercises and operations. The new centrifuge can go from 0 to 9 G in just one second and simulate real-time missions, so it will be an invaluable part of their training programmes.